How to Polish a Brass Instrument. Brass is the basic metal used in the construction of the trumpet, trombone, French horn and tuba. Very often the instrument has a silver-hued metal plating to give it a brilliant shine and, frequently, a lacquer finish over that. Use a mild soap on a clean washrag to remove any accumulated residue. Rinse and dry the instrument. Determine if the instrument has a lacquer finish sprayed over silver plating. If it does, do not use a silver cleaner on it! Use silver cleaning paste or cream only if a silver-plated instrument has no lacquer finish! In this case, use very small amounts of the paste or cream on a small portion of the bell. Remove the paste or cream with a damp rag and note the effect on the metal beneath. Be cautious and note if the silver plating is so thin that it is wearing away and the darker metal beneath is being exposed. If so, stop! Continue using in larger areas only if you see a rich and even reflection in the metal. 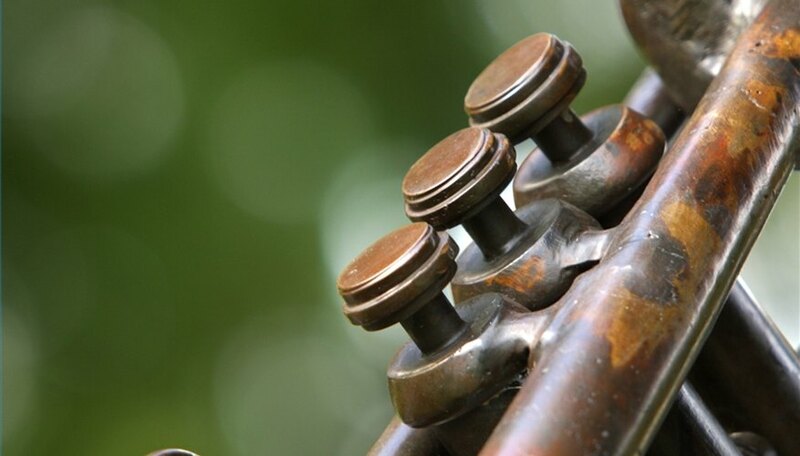 Perspiration or fluid from your hands can cause continuing discoloration on a horn. Many instrumentalists use a small, clean cloth to shield the horn where it touches the skin. A leather grip can be purchased to wrap around the valve casing of the trumpet or cornet to achieve this protection. Hagerty's non-abrasive silver polish is recommended by the repair department of Best Instrument Repair of Oakland, CA. Note that replating is expensive - a complete re-lacquer job on a trumpet can cost $375. Silver polish on lacquer will cause irreversible damage! Keep the silver cleaning cream or paste from penetrating the interior portions of the valves and slides.